Colors can make us feel happy or sad, they can make us feel stressful or relaxed. Warm colors often evoke feelings of happiness, optimism and energy. 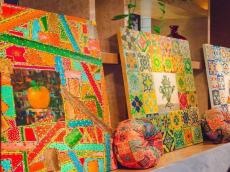 Filled with sunlight and bright colors,a first solo exhibition of the young and talented artist Milena Nabiyeva "Minabi - Patterns of the Universe" was held in the Baku Museum Center in February, Trend Life reported. The exhibition aroused great interest of art lovers. This time, Milena decided to present her works in a cozy atmosphere of the restaurant and under pleasant classical music. The artist wants to give the colors even greater brightness not only in color, but also to add the sparkle. The combination of colors in the artist's works is the triumph of love and life. She often uses contour technique, which requires attention and patience. For Milena, work in this technique is like immersion in a world where the edges of reality are blurred away. By the way, artist draws inspiration from people.